Natural colours for unique multi-sensory experiences! Refine your products with our wide range of natural flavours and extracts derived from the best of nature. Nature’s best for innovative worlds of indulgence! Natural ingredients in dried form for a unique and natural taste sensation! See, taste, smell, feel, hear – experience the finest indulgence with all the senses! 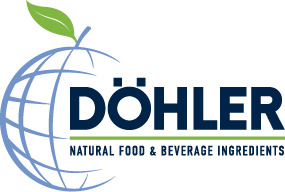 Starting with nature, we at Döhler pave the way for turning smart ideas into amazing food and beverages. Döhler Coating-Systems provide confectionery with that perfect finishing touch! More energy, vitality or relaxation – products with functional added value are in greater demand than ever before. Premium ingredients for the finest and most exclusive chocolate creations. Plant-based drinks which combine taste, a creamy mouthfeel and optimised nutritional values. Fewer calories, less sweet, more natural and full taste. Brewed tea, antiox or matcha? Teas from a different angle. Here you can find exclusive information for your next food and beverage innovation. We support innovative start-ups for long-term success! Give your sweet treats a brilliant appearance! Natural, fruity, fresh – create unique taste sensations with our juice concentrates. Our vegetable ingredients allow you to combine three of the most important trends at the same time: naturalness, health and convenience. Create unique and special taste sensations with our Brown Flavours! The same full taste, but fewer calories and less sweet! Fruity pleasure with healthy added value! Fruity and savory smoothies for the modern lifestyle. Focus on Generation Y: pure refreshment for a modern lifestyle – without alcohol! Less sugar – powerful taste & high functionality.